Home News What Is eSIM? And How eSIM Works? What is eSIM and how does it work? Now eSIM is dominated by headlines. Because Apple has used this eSIM in its new phone iPhone XS and XS Max. Also they have used eSIM for dual SIM support for connectivity in Apple Watch Series 3 and Watch Series 4. But people are not able to know about eSIM due to lack complete information. You people have probably heard a lot about eSIM and wondered how it is different from the normal SIM. Some might even be wondering if it can be used in their devices or not. To answer all these questions, this article is all about eSIM and how it works is presented to you. It is expected that they will be able to answer all your questions in a nutshell. We can see that phones and networks can now adopt these electronic SIM cards for their future smartphones because this will not require them in their devices and physical SIM card (and a SIM slot). This will save a lot of space. These eSIMs are not only suitable for Manufactures, but it is also very suitable for users. So what happens is this eSIM? And what exactly is it going to provide for our smart phone? Keep reading this further to know. The full form of “eSIM” is the embedded SIM (Subscriber Identity Module) card. No physical SIM cards are used in it nor do you require any physical swapping. This eSIM will not be forgotten to call the next generation connected consumer devices SIM. eSIM requires a network or carrier to run properly and which is enabled later by them, so for your new iPhone XS or XS Max you have to search for an eSIM-compatible network which Support to run on a second SIM support. An eSIM basically works just like a small chip inside your phone and it works just like an NFC chip. The information that is eSIM above is rewritable, that means you can change the operator from a simple phone call only. Also, a data plan can be added easily – in addition to connecting eSIMs with your mobile account is a matter of minutes. 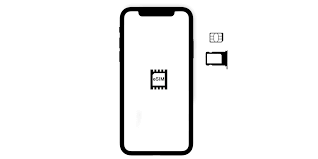 One thing you must note is that the iPhone XS and XS Max also have a physical SIM slot for a SIM card – the same eSIM can be used like a second SIM support. Is not it a very interesting thing eSIM uses GSMA technology, with the association of other mobile networks. This GSMA is a worldwide standard of eSIM all over the world. eSIM has been launched in iPhone XS and XS Max. Also we can see it in Apple Watch Series 3 and Watch Series 4. It is being highly appreciated by users. If I talk about countries, then only in 10 countries, this eSIM is currently supporting. Which are of Austria, Canada, Croatia, the Czech Republic, Germany, Hungary, India, Spain, UK, and US. The company says that very soon this service will be available in other countries. What does eSIM mean for your Devices? If you look at the design point of view of one of the very best advantages which they offer, then you can also use this eSIM in a small device as there is no extra SIM tray required to keep the SIM card in it. Does not fall. Also, the manufacturer does not need to distribute many SIM cards to the network easily. Also eSIMs are great for your other devices like laptops and tablets because seamless connectivity can be achieved without a physical SIM card. Also, it can be connected with many devices simultaneously through eSIMs, because eSIMs do not require extra space. Which devices can eSIM be used? Apple has used eSIM’s connectivity in its Apple Watch Series 3 and Watch Series 4 as well as new iPhone XS and XS Max on the dual SIM support. Google’s Pixel 2 also supports eSIM but it is only limited to Google’s Google Project Fi. Which Network Providers Supports eSIM in India? At present there are just two network providers in India who support eSIM technology; That is Jio and Airtel. Asked how the eSIM works in the new iPhone XS and XS Max, they said that if you have the provision of a physical and eSIM and they are connected with two separate networks, then your iPhone will have both screens They will also show in the same time. If your handset is in standby mode and both SIM and eSIM are provisioned, then customers can receive calls and texts in both of their SIMs. You can then select a “default” line in which you can use calls, SMS, iMessage and FaceTime. The second line is only for SMS and voice. Alternatively you can use Secondary only for cellular data – this can be useful if you are going abroad and using a local data eSIM. You can use more than one eSIM in your iPhone, but you can only use one SIM at a time. How do you use eSIM in iPhone XS and XS Max? 3. After that the iPhone has to be used to scan the QR code which provides you the carrier – can also ask you to enter an activation code. 1. For this, first go to App Store and then download your carrier’s app. 2. You can use the same app to buy a cellular plan. You can also label your plans for which you have to do this Settings> Cellular Then tap on the number whose label you want to change. After this you have to tap the Cellular Plan Label and then you have to enter a new label or a custom label. eSIM is a great option for a regular traveler? With the help of eSIM, a regular traveler is very easy. As we know it is the work of travellers that going to other countries to move about. They always have trouble with SIM. Take the new SIM together and remove the old and apply the new one. There are many charges, such as roaming charges ESIM is a great option to avoid all these troubles. It is very easy to activate and does not require a physical SIM. Apart from this, they can easily connect to many devices. Let’s know about the benefits of eSIM. It is of a nano sim piece size That is why it gets fit anywhere. There is no need for a SIM tray. In this one user can switch to another operator very soon. Change without a SIM card. More useful for travelers. You can connect more devices together. As if you have a smartphone and also a smartwatch, then you can connect both of them to the same eSIM. It has the facility of remote provisioning, so that you do not have to wait until the old SIM is deactivated, but the new eSIM can be easily activated. This is embedded with a SIM card phone, so all the information about this subscriber is stored, which is necessary to identify and authenticate the mobile subscriber. You do not need to change the SIM card for the new SIM. You can do this without making any changes. eSIM is more secure than the other SIM card. What are the disadvantages of eSIM? As the coins have two aspects, therefore eSIM too, so let’s know more about it. If you have a lot of devices and you keep changing in your operators regular interval then it will create a slight confusion for you, because if all your devices are connected then there may be confusion in changing it and you have to activate the SIM card With the help of that device software. You can not remove the old SIM card and put a new SIM card like you used to do before. If your battery is low and you want to make a call by connecting your eSIM to a friend’s phone, then it may be a problem as the SIM card is activated and it is not too fast and easy. To activate eSIM you have to contact the operator and you can activate the SIM just by entering the userid and password sent by them. What is the glory of eSIMs? The glory of eSIMs is very bright. Large companies like Apple and Google have used it and have announced that if there is a future for SIM cards then it is only eSIM. With the new GSMA technology, users can easily switch to other network operators. It does not need to get much trouble in it, just one phone call can be done. Together, as we all know, day-to-day mobile and digital devices are becoming smaller. In this case, SIM size is a very big factor. Apart from this, due to the rewritable feature, change in operator can be changed. Simultaneously, there will be no tension of SIM for travellers. Future is only eSIM because once you get embedded with your devices, you can take full advantage of its features. I hope you have people eSIM (what is eSIM in Hindi)? Gave full information about and hope you guys have come to understand about what eSIM is. If you have any doubts about this article in your mind or you want some improvement in it then you can write down comments for it. With your thoughts, we will get a chance to learn something and improve it. If you have a good e-commerce site, please post this on social networks such as Facebook, Google+ and Twitter to show your happiness and excitement.